Souls of the Unknown :: Joining :: Join HERE! Angeli is tall, slender, yet overflowing with the essence of power. Her arms and calves are to the max and over of feminine muscles. She has a very light tan , and large doe eyes, the kind you'd associate with little Red Riding Hood. Her night black, wavy and unruly hair falls to nearly her waist, above her slender and taunting hips. Small in the chest area, she compensates with her long, elegant legs. She's a thin person, or more accurately , lithe. There is a savage grace to her movements , beauty and nobility, harsh as her past may have been. Her facial features can be described in two ways; youthful, or a determination and beauty beyond her years. Her eyes, unlike a does in color, can only be called a resplendent sapphire, an entrancing cobalt. Struck by the right angles of light, they might seem a light violet. Unlike when she was barely a child, her independent and fierce aura is not laughable at, or ridiculous. It is worthy of royalty. Think of a tall, lean wolf who can run fast with great stamina, and is strong enough to kill with one well placed bite instantly. Make of it a shadow, blending with the darkest of nights. Think of dark Blue eyes flashing violet in the night. Think of something royal, beautiful, entrancing and mystical. 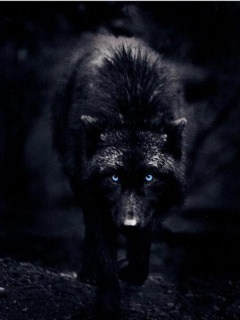 A wolf that makes you yearn and long for what you don't understand. Also think of it as something wild, untamable. Something dangerous as it is deadly. Taller than many wolves, she almost seems like one of the mythically large wolf form of some legends, she has traits finer than many,, her eyes able to change from cobalt to violet when her moods change, the cobalt melting into the other as her emotion heightens, or just changing as the light strikes them. Angeli is quite ....difficult to describe. Though she may flirt unabashedly, she leaves one thing clear; no one will have her. This is the first year she'll go into heat, and even with her minimal knowledge, she understands that she should have started the heat cycles a few years back. And even her human, is a virgin. She's a keen huntress, with a wide variety of prey to hunt in different ways. Her instincts are sharp and strong, her resolve withstanding. She's intoxicating, in ways that could leave you without words. You might dislike her, or think you do, but when she leaves, you'd find yourself thinking of her, and not always in a bad way, s'much has you'd wish otherwise. Shes a fierce, independently strong female , with a knack for leading. At times she may seem a bit ...off...weird, or different. At others, she's perfect as can be. She doesn't take no for an answer, won't follow rules imposed on her. She has a very fine gift for finding loopholes in rules and commands, and isn't shy in using it. By her blood, the will to lead and rise flows through her, tangible and defiant to those who'd wish to see her neat and squashed into a more submissive label, intensified by her own rebellion and recklessness. Angeli's family hasn't had the title of royalty for sometime, yet the blood flows strong in her. Though for just as many generations, her family hasn't had any werewolves in the bloodlines either, the ancient trace of them has come full-force on her. She shifted particularly earlier than was normal by werewolf standards, destroying her family on full-moon's midnight , January 25th. Waking up the next morning in her own blood soaked bed, she'd been horrified at the gory remains on her wall. Her father,mother, and younger sister dead, she fled the only home shed ever known. Feeding on whatever she could get her teeth on until she managed to control the hunger, slightly, she moved back into 'society' among humans. With whatever precious money she had, she rented an apartment , lived for a few months there at the age of 21 before being chased of by the threats of being discovered. Traveling more until her funds dwindled , she settled for a bit longer in a city , giving herself the good life with the money shed gathered and saved since she...left , her home.Sensing others of her kind, she stayed long after she'd planned to leave. Besides the scent of wolves, there are other non-human trail she doesn't know. Curious, she plans on finding others of her kind and joining a pack. Angeli bid goodnight to her family, ruffling her younger siblings hair before going to her upstairs bedroom. She signed as she entered the room, taking in the dark blue and black colored walls, the violet bedding and dark wood desk to onside. Moving silently to her queen sized bed, she slipped underneath the black sheets, the silk soft against her minimally tanned skin. Her hair spread around her on the pillow , the strands reaching out wards as if to imitate the suns rays, her face being the center. She stared at the ceiling, a feeling of dread and finality making her almost feel sick to the stomach. Forcing her eyes closed, she tried to sleep. Unable to, she stood up and opened the window to the right of her bed. The full moon, semi-obscured by a slim clump of clouds seemed ominous to her, where other nights it had been reassuring. Shivering , she crawled back underneath the covers, her young heart speeding up, sweat starting to bead on the forehead as she thrashed around restless in her sleep around midnight. She spammed at some point, quivering as her face elongated, her hands curled and uncurled. Her hair shrunk and grew, her bones cracked then adjusted. She screamed , then screamed to wake the dead as the full moon was uncovered from the shadows of the clouds and fell full on her. It was almost midnight exactly, and the her parents came crashing in, horrified and worried at the same time. Her sister came after. A few seconds before twelve, she was semi-shifted, ridiculously similar to the humans current image of a werewolf standing on two legs. She looked mangy, her fur out on some places, only patches of skin on others. She attacked. Raked with inch long, or longer, nails. Bit with large canines and ate. Exact midnight came, and she morphed fully. Now, a wolf tore at the remains. Gnawing on bones and breaking some. It howled, ate for some long time. Then it leapt on the bed, now drenched and stained in blood, and it fell asleep. The transition back to human happened in a practical flash, it didn't hurt or register, it just was. Morning came, and she ran. Ran into the woods surrounding the home, nothing but her red hoodie and her costly skinny jeans on with some nike's. Her hair streaming behind her, she ran, scaled and didn't look back as her feet hit the ground with the silence of a predator. APPROVED! Welcome to the site lovely. Any question don't hesitate to ask us, we don't bite! Not sure if I should add this up there or post here, so....here is safer I guess. This is the power that she has that was 'recently ' approved before my abrupt absence due to RL. As in, she can create a sort of, 'air bubble' (invisible) that keeps everyone away from her , keeps her in a 'silent' zone safe from other powers and weapons, allowing only those who she chooses to pass through the barrier? She crouched down, the spear flying a over her, missing its intended target. Her eyes flashed, sharp and angry, the pupils dilating Like those of a wolfs. She now understood that these creatures, they weren't playing. They meant to kill her. They , in large numbers like these, were dangerous. She closed her eyes for the fraction of a second, pulling from deep within herself until she felt something surge outwards. The air seemed to ripple, a powerful thrust of air sending all the creatures within ten feet of her flying in all directions. The space around her was quiet, silent, devoid of sound and wind. She saw the invisible barrier ripple again, waves spreading out from the top downwards as it was poked savagely by a though spear. He creature kept pushing, trying to break through until the spear broke and his shoulder rubbed up against the barrier. It seemed to cause him pain, but of which she didn't know. Her eyes were now wide open, conniving. She let one of the creatures running at the barrier through, focusing on it and giving him a shove inwards in her thoughts. He passed, surprised , it tripped over its own feet and fell to the ground. She shifted immediately, a tearing sound as the essence of her wolf broke brought, burying the human as it dug into the creatures body, meat flying in all directions. She moved, walked towards the outer beings, enveloping them into he barrier and tearing them apart bit by bit. There were ten left after, they ran. smart move,she thought,looking at the carnage around her. He adrenaline gone from her, her wolf receded, the human coming out and seeing all she'd done. She abruptly fell on her knees, back bending until her head was against the ground, her hands tearing at the ground as her body spasmed. Memories were invading her of her past life, of when she'd still had parents and a sibling. Its time to let go. If you keep them, they will only destroy you, her wolf whispered at the back of her mind.thi was the other side of her , the center of her own complicated humanity. This was her inner self speaking, yet the shallow piece wasn't ready. May I use this as my siggy?